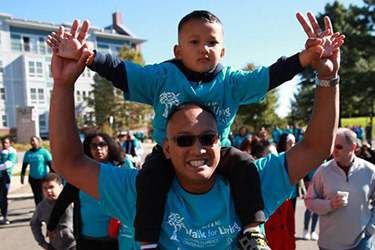 Chad Gammad, and his son, Asher Jethro Rai Gammad, at last year’s walk. Over the years, the walk has raised over $1.6 million. SEPTEMBER 20, 2018, CHELSEA – Steve Saling is a landscape architect, so he has a particular appreciation for detail. As he takes visitors on a tour of his home at the Leonard Florence Center for Living, there are many impressive details to point out. At the Chelsea Jewish Lifecare facility for people with amyotrophic lateral sclerosis (ALS) and multiple sclerosis, Saling calls attention to the bamboo ceiling and stained-glass windows of the chapel, the tin ceiling atop the kosher deli, and the carefully landscaped peace garden outside that he helped design, which has reinforcements under the grass that make it wheelchair-accessible. He also points out the details that make the Leonard Florence Center arguably the premiere care facility for ALS and MS in the country. He welcomes you to the entrance of his home, which has a doorbell, a mailbox, and a lantern next to the front door, and looks more like the entrance to a typical house than anything at a nursing home. Maintaining this high quality of life can be expensive. That’s why on Sept. 30 starting at 10 a.m., Chelsea Jewish Lifecare will host its 10th annual Walk for Living, which has raised over $1.6 million for resident care and activities. Steve Saling in the chapel at Leonard Florence Center for Living. The walk will begin at Chelsea Jewish Lifecare, 165 Captains Row in Admirals Hill. An anticipated 700 people, including some residents, will walk a 2-mile loop that will bring them back to where they started. After the walk, a free petting zoo, face painting station, dance performances, a barbecue lunch, and more will be available. Matt Siegel, the popular host of Kiss 108’s “Matty in the Morning,” will serve as walk host. In large part because of fund-raisers and donors, the technology at the Steve Saling ALS Residence is remarkable. With only the blink of an eye, Saling opens the front door. He has activated the Promixis Environment Automation Controller (PEAC), which is connected to everything in the building, from doors to elevators to light switches to air conditioning to the large, flat screen TV in his bedroom. After Saling blinks and the front door swings open, you walk into the homey, graciously appointed ALS residence, one of the 10 separate homes at Leonard Florence that each host 10 residents. Inside the homes, there are no roommates, nurses’ stations, or loud announcements. Instead, there is an electric fireplace, a top-of-the-line kitchen, and a garden in the back. Instead of the set dining times at many other nursing homes, residents work with a specialized dietary staff to create meals they can eat whenever they want. Saling’s building is named after him because he was the first resident of the Leonard Florence Center when it opened in March 2010. As a landscape architect specializing in handicapped accessibility, Saling was also instrumental in designing the layout and integrating technology into the facility. It all began when he met two of Chelsea Lifecare’s leaders, Barry Berman and Betsy Mullen, at an ALS conference in 2007. Saling had been diagnosed with ALS the previous year, and was looking into his options. Although doctors had told him he had at most five years to live, Saling was determined to go much longer, and live a happy, fulfilling life. Meanwhile, Berman and Mullen were attending the conference because they were preparing to build a facility for those with ALS and MS, and wanted to learn more about their specific needs. 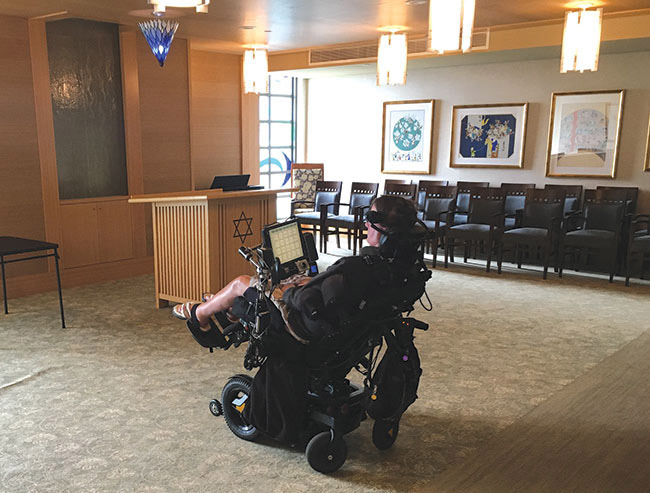 Saling was still mobile at that point, and over the next three years threw himself wholeheartedly into creating a high-tech, fully accessible facility that would allow him to live for as long as he chooses. Technology is not the only factor creating improved quality of life for Leonard Florence residents. The center hosts a wide variety of entertainment, games, and concerts, and residents can rent vans whenever they’d like to go on external outings. The center also hosts exciting field trips: last November, many residents went to Disney World in Orlando. Saling has even been on skydiving and scuba diving trips. “We try to be very liberal in a lot of these things we do,” says Bill Arria, executive director of Leonard Florence. It should come as no surprise that Saling will attend this year’s Walk for Living. The walk fits in well with his enthusiastic, can-do attitude. To register for the walk, visit walkforliving.org. You can also register on walk day starting at 9 a.m.